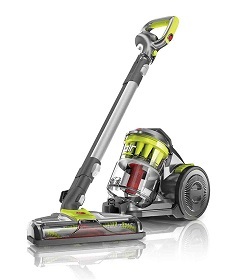 The Hoover Air is a mid sized vacuum cleaner that comes equipped with their well known Windtunnel™ 3 technology. Like most other canister vacuums it is versatile and designed for a variety of floor types. These kinds of cleaners tend to work best on hard floors like tile, hardwood, and laminate since all the weight isn’t concentrated over the power head. The brushes are not pushed as hard into the surface so there is much less chance of damaging those delicate surfaces. Plus, they usually come with a variety of attachments for just about any type of cleaning you will encounter around the home. The Air is no exception to this but there are things it does well and some it struggles with. What does Hoover mean when they say ‘Windtunnel Technology’? In its’ simplest terms this means a unique design to the airflow which causes air channels to form under the head. Each channel helps lift the dirt up so the suction can easily pull it in. Not only does this help pick up more dirt and dust from the carpet but it also helps prevent it from being blown around, a major problem with some brands. Blowing dust will go up into the air and settle on many objects in your home. This is what you want your vacuum to eliminate and the Windtunnel has been refined over the years to do just that. The Hoover Air canister vacuum does a couple of things quite well. First, it is a very versatile machine that comes with a variety of attachments. These include the 3 in 1 tool, a hard floor brush, and their powered head with spinning brushes. You can also turn the brush roll off when operating on smoother floors if you don’t want to use the brush attachment. It can handle many types of surfaces and since it is very lightweight you can easily move it around your home. It also filters the air very well, as the HEPA filter traps virtually all of the dirt and dust particles so you don’t end up breathing them back in. If you have asthma or suffer from allergies then a HEPA filtration system is a must have on any new vacuums you are comparing. One thing that the Air bagless will struggle with is high piled or thick carpeting. When dealing with these types of carpets it takes a special kind of canister vacuum to be able to effectively pull the debris out from within the fibers, and this model just doesn’t have enough to do it. Most canisters struggle with this as the design just doesn’t push the brushes down into the rug like on a heavy upright. Sure you can clean carpeted floors with it but if you have thicker ones installed in your home you will want to look elsewhere, like perhaps the Miele C3 Soft Carpet which has a large power head designed just for this task. Overall the Hoover Air canister is effective on most surfaces and has the extra attachments for such things as furniture, bedding, and curtains. It is bagless so you won’t be spending money on replacement bags and it does have full machine HEPA filtration. If you use it on a regular basis you will greatly reduce the dust that is floating around your home. It makes sense if your house has a variety of floor types or even mostly smooth ones where you don’t need the heft of a larger cleaner. For more information about it including current pricing and shipping options, click here to visit our most recommended internet supplier.